What's a Tune-Up? When Should You Get One? What’s a Tune-Up? When Should You Get One? If your car is experiencing problems, you might think that it’s time for a tune-up. Maybe your engine misfired, or the performance seems a little off. You don’t think there’s any major problem—the engine turns over eventually, and you can still get from point A to point B—but maybe you need to have a mechanic take a look. But what exactly is part of a standard tune-up? 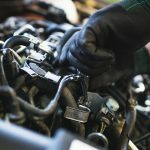 Today we’ll go over this, as well as take a look at some of the signs that your vehicle is ready for an auto tune-up in Lubbock, TX. Air filter problems: If you’re noticing performance problems like poor gas mileage or the car just not having as much get up and go, it could be a clogged air filter. Your mechanic will check this out during a tune-up. Engine misfire: This is a sign that you have faulty or expired spark plugs. Most spark plugs are supposed to last 100,000 miles, but this doesn’t always happen. Check engine light: It might be tempting to ignore that check engine light, but rest assured that it’s popped on for a reason. One common cause is a faulty oxygen sensor, which could cause your car to fail an emissions test and result in bad fuel economy. Oxygen sensors are supposed to last around 90,000 miles, and a busted sensor could lead to serious internal engine problems. Engine deposits: Poor-quality or contaminated gasoline is liable to result in the builup of gunk in the fuel lines. A tune-up will spot this issue and a fuel injection system cleaning will be necessary. For a high-quality auto tune-up in Lubbock, TX, the right choice is M & M Tire & Service Center. We handle everything from routine maintenance to major repairs. We tailor our services to each individual vehicle’s needs. We never cut corners, instead relying on our team’s years of expertise and our top diagnostic systems to get the job done right. M & M Tire & Service Center offers a wide range of services, including oil changes, tune-ups, brake servicing, tire replacement, suspension work and more. We even have specialty expertise in tires, selling all of the top name brands. When your car hits the road again, you can rest assured that it’s in top working order. Contact us today to schedule an appointment—we look forward to helping you! Does the Type of Gasoline You Get Really Matter?